For Jake’s birthday, I also made him this chocolate salami. You see, since last year he’s been making sausage at home! He’s made garlic wine, chorizo, andouille, spicy Italian and more. So I figured I’d make him a dessert salami. (Why not, right?) When I walked in and held it up saying, “Look what I made you!” I’m pretty sure he thought I made a sausage somehow. It’s a chocolate prank! One thing that’s cool about this is that you can add any mix-ins you want, I bet pretzels would be good and pistachios would be really pretty. Or maybe marshmallows? It’s willy-nilly. You can do what you want. You could even slice it and make ice cream sandwiches! I sure wouldn’t stop you. Follow your heart. So this is a funny thing to make as a prank or a super-fun treat for someone who loves sausages or any cured meaty goodness. But mostly it tastes goo-ood. Place the chocolate and butter in a heat proof bowl over a pot of simmering water, melting them together. Remove from heat as soon as the chocolate is melted. Set aside to cool slightly. 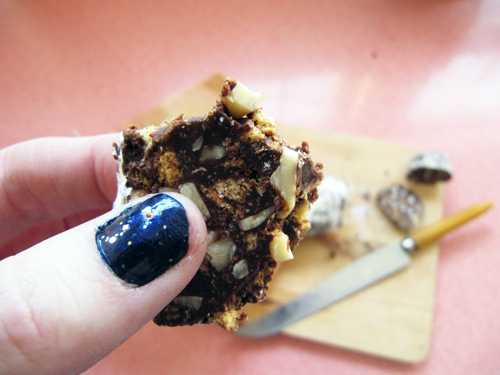 Stir in the condensed milk, graham cracker pieces, and 1/2 cup of the almonds. Stir until combined. 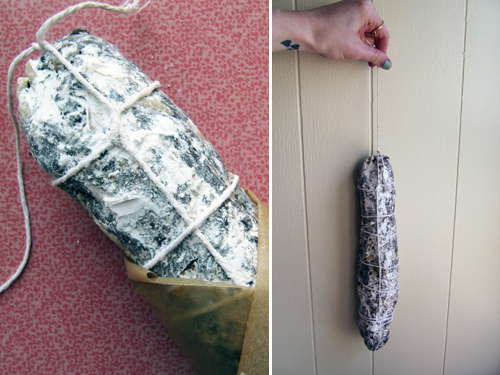 Pour onto a piece of plastic wrap and using the plastic form into a salami. Press the remaining 1/4 cup of almonds onto the outside. Chill until firm, at least an hour. Remove from the fridge and roll through powdered sugar, coating the whole thing. Slice and serve! To further explore Jake’s love for cured meats we went to Zingerman’s, where the meat and cheese flow like wine. P.S. We both totally got a meat cones. They look like this. unsliced, that really does look like fancy salami! I bet Jake was tricked fur realz! 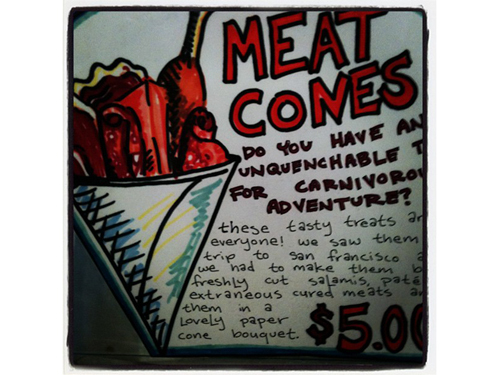 also, I totes want a meat cone now! Megan, I’ve always wanted to try this! Yours looks perfect! Thanks, Heather! I can’t wait to see when you make it! You’ve got mad skillz. 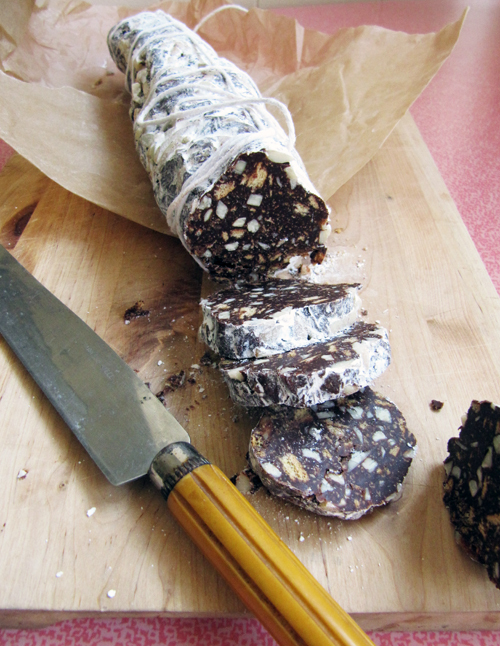 Oh goodness, when I lived in Italy chocolate salami was always such a treat since you cant find it in most restaurants. An Italian explained to me it’s usually at at home only treat, like rice crispy treats for us. And the way you wrapped it is so cute. Thanks Nikki! That’s so cool that this is the rice krispy treat of Italy. Love that! I have been wanting to make this but just haven’t gotten around to it!! The recipe I found calls for Lorna Doone cookies, some crushed fine and some left chunky and whatever else floats your boat. Looks sooo good!! What an awesome idea! Looks great! Found you through SprinkleBakes post on FB! Kerri – You totally should make it! Lorna would love to be in this, I’m sure. Thanks Sarah Jane! My mom found me all those trays at garage sales; can you even believe it?! Oooh I bet your kitchen is lovely. Found your blog through Sprinkle Bakes. I totally have to try this one, especially for the holidays! Yummm. Love this so much! Homemade sausage is so great and chocolate pretend sausage is super cool. Zingerman’s knows their meat, for sure! Thanks Nicole! And yeah man, Zingerman’s is the very best. Looks Similar to a Nigella Lawson dessert. 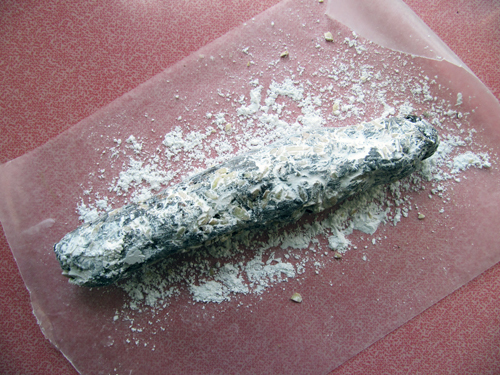 http://www.nigella.com/recipes/view/chocolate-salame. Yep, lots of people have made this probably.